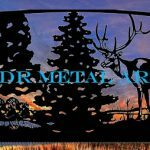 South Carolina Wildlife Silhouette Driveway Gate - Custom Driveway Gates - Iron Steel & Aluminum - JDR Metal Art - FREE Standard Shipping! 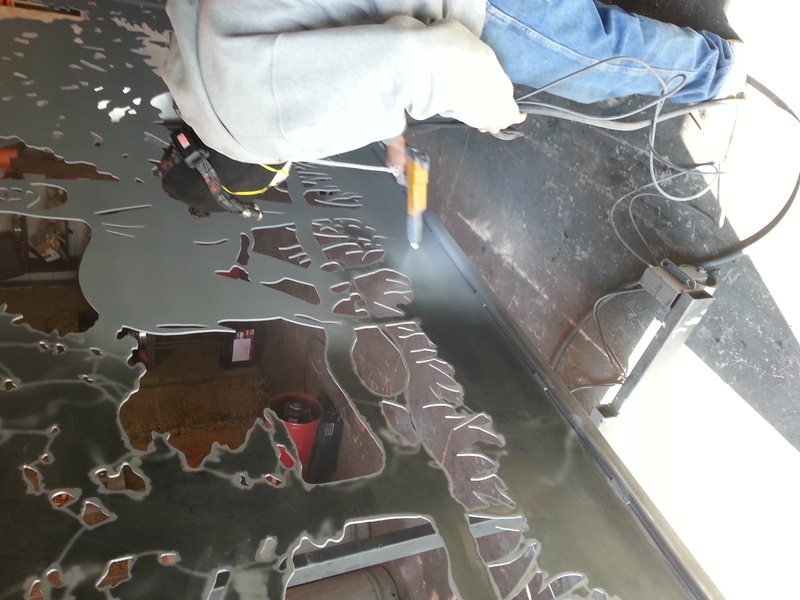 Last week we plasma cut an ornamental wildlife themed 14′ single swing driveway gate for a South Carolina residence. We then gave the gate a beautiful, long-lasting powder coated finish. 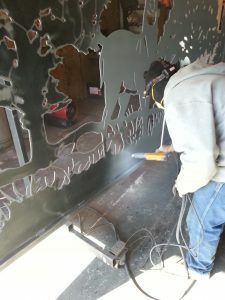 The first layer of powder coat we applied is a gray zinc rich primer formulated especially for outdoor metal items. It resists corrosion extremely well. It is applied onto the driveway gate as a uniform layer of electrostatic charged dust. We push the gates into the oven and heat them until the powder melts into a gel. We then pull the gates back out and spray the top coat, in this case black. The gates go back into the oven for a final cycle to reach full cure temperature at 400 degrees for 10 to 15 minutes. Powder coated driveway gate with black top coat applied. It is a 60% “super durable” gloss black specifically formulated to provide superior color and gloss retention in even the harshest of environments. 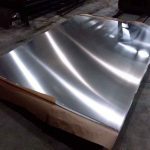 Powder coat is extremely tough and long lasting when it is applied according to our standards. 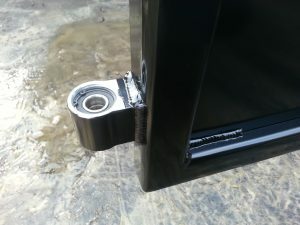 Here is a closeup picture of one of the hinges with its sealed bearing shown. The gate will attach to a post with the hinge brackets already welded to it, also. There is a slotted yoke to allow for adjustment. Each hinge is rated to handle 2000lbs so that is a total of 4000lbs. The gate only weighs about 750lbs total so there should be no issues for a very long time. Each hinge is backed by a lifetime component replacement warranty. After we finished baking the powder coat on the gates we spent a couple of hours building a 14′ skid on which to safely ship the finished driveway gate to our customer’s home. We used many layers of shipping foam, cardboard, plywood and straps to ensure that there is no question this driveway gate will arrive in perfect condition at it’s South Carolina destination.